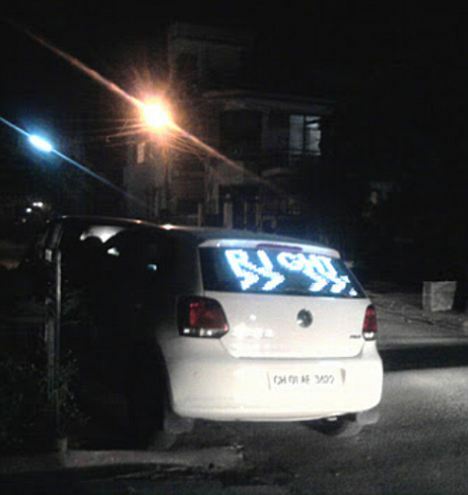 Rear window LED offers ‘friendly’ advice to the driver behind – Recipe for road rage? The only communication device open to most drivers is the horn – or, in extreme cases, waving arms out the window and yelling. But a new LED panel aims to change that – letting drivers send a message via Bluetooth from their mobile phone to a grid of LED lights on the back. What manner of chaos this might unleash on the world’s roads remains to be seen. Early pictures and video of the device shows it offering tips from the rear window of designer Gagandeep Singh’s Volkswagen Polo. The LEDs are hand-soldered into a grid, and spaced at 2cm intervals across the entire back windshield. The 38 x 16 ‘resolution of the screen makes it ideal for short, two-word messages – words scroll across it from left to right, just like messages on motorway signs. Soldering together the grid took two days. The circuits that feed it messages were also programmed by hand. The trickiest parts were ‘special characters’ such as helpful arrows pointing the direction that other drivers should steer. The unit is controlled by a primitive AT89C51 microcontroller. Singh claims that the spacing of the tiny LEDs mean that the rear windscreen is fully transparent, so it’s safe to use behind the wheel. Singh is now attempting to add a Bluetooth receiver, so drivers can update it via Bluetooth from a mobile phone. Responsible road users would, of course, pull over to type in any advice, by which time the intended recipient might be miles ahead. LOWER DRINK-driving limits come into effect from midnight, reducing the maximum blood-alcohol level to 20mg per 100ml of blood in some cases. The changes, which bring Irish law into line with European levels, will see the current limit of 80mg drop to 50mg for most drivers. Under the regime, professional drivers, learner drivers and those who are newly qualified will be subject to a lower 20mg limit, as will other categories such as those driving tractors or cars with trailers. A penalty system is also being introduced to deal with offences detected under the limits. Previously all drink-driving offences were dealt with in the courts and an automatic disqualification applied to convictions. Minister for Transport Leo Varadkar yesterday joined the Road Safety Authority and An Garda Síochána to raise awareness of the limits, ahead of a Garda safety campaign for the bank holiday weekend. Mr Varadkar said the measures sent out a very clear signal that drinking and driving “cannot be tolerated and will be prosecuted”. The Minister said similar measures in Queensland, Australia, saw an 18 per cent reduction in fatal collisions and 14 per cent in serious-injury collisions. Mr Varadkar denied the system was more lenient than one in which those found to have been driving over the limit automatically ended up in court. “It’s a system of graduated penalties. If somebody is between 50mg and 80mg, they will get penalty points. If they’re above 80mg, they will get banned from driving. He said the system delivered a “zero tolerance policy” on drink-driving for learner drivers and those who drove professionally. The Minister said enforcement was the key and the Government fully understood that An Garda Síochána was under pressure and already over budget this year. Garda Chief Supt Aidan Reid said the force was ready to enforce the drink-driving limits from the time they come into effect at midnight. He said the changes would have a “significant impact” on all drivers. Chief Supt Reid said the system of penalties took account of first-time offenders, but that overall the effect would involve a court appearance for anyone subsequently caught drink-driving. He also reminded drivers that it was a legal requirement to carry a valid driving licence when driving. “If a driver cannot produce his or her driving licence when required to undergo a preliminary breath test, the lower limit of 20 mg will apply to that driver, until such time as the driver produces a valid driving licence.” Asked what the lower alcohol levels meant in terms of the quantity of alcohol a person could safely consume, he said the only advice was never to drink and drive. AA director of policy Conor Faughnan welcomed the graduated penalty system and said 80 per cent of motorists surveyed by the organisation were in favour. 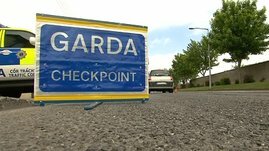 * For a blood-alcohol level of 50mg-80mg, the driver will be arrested, brought to a Garda station and required to provide breath or blood or urine specimens. * In all cases where the level is between 50mg and 80mg and the driver is not a “specified” person (eg, a learner or a professional driver) and has not had a fixed penalty for drink-driving in the previous three years, a fine of €200 and three penalty points will apply. * Points will remain on the driving licence record for a period of three years. * Any driver accumulating 12 points in three years will be disqualified from driving for six months. * For a blood-alcohol level of 80mg-100mg, the arrested driver will be required to provide breath, urine or blood samples after arrest. The applicable fine will be €400 and the person will be disqualified for six months. * For a blood-alcohol level of 20mg-80mg, the arrested driver will be required to provide breath, urine or blood samples. The applicable fine (provided the person has not received a fixed penalty in the previous three years under the scheme) will be €200 and the person will be disqualified for three months. 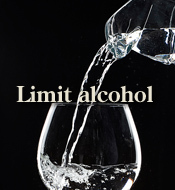 * District Court penalties will apply where the blood-alcohol level is above 100mg or above 80mg for those classed as “specified” persons, where the person is not eligible to be served with a fixed penalty notice or where a fixed penalty has not been paid. * A sliding scale also applies to convictions with a consequent driving ban of between six months and six years, depending on the blood-alcohol limit applying to the driver concerned. * The maximum fine remains at €5,000 and/or six months’ imprisonment. As the August Bank Holiday nears and thousands of people prepare to head off for the weekend, the Road Safety Authority (RSA) and An Garda Síochána are reminding drivers to be aware of the dangers of driving while tired. The call comes as research suggests that driver fatigue could be a contributory factor in as many as one in five driver deaths in Ireland every year. Furthermore, this risk is increased during a bank holiday weekend when there are more drivers on the roads, often travelling long journeys without a break. Previous research conducted by the RSA into driver fatigue revealed that two in five drivers believed that rolling down the windows will combat tiredness while driving. However, the RSA has reminded drivers that these tactics don’t work and that driving while tired can be more dangerous than drink driving. “We’ve heard many stories about how people stay awake behind the wheel of the car, including rolling down the windows, turning up the music and even trapping their hair in the sun roof. Although these are certainly creative, they don’t work and will not stop you falling asleep if you’re a tired driver. The only cure for driver fatigue is sleep so if you’re behind the wheel of the car, don’t risk your life, the lives of your passengers or other people on the road by fighting sleep at the wheel. Pull in somewhere safe, drink a cup of coffee and take a 15 minute nap. When you wake up, get out of the car, walk around and get some air. From midnight on Monday 15th November 2010, new Garda mobile safety cameras will be in use across Irish roads. Slow down. Save a life. It could be yours. It could be someone in your family, your next-door neighbour, a work colleague or someone you’ve never met. Let’s all work together and reduce the number of deaths on our roads. Excessive or inappropriate speeding is a major factor in road traffic collisions. Safety cameras will be on the roads all across Ireland where fatal collisions are happening as a result of inappropriate speed. The locations of these roads are available by clicking on the map. Further information on the safety cameras and a list of frequently asked questions is available by clicking on the links to the right-hand side. On a phased basis, GoSafe will provide 6,000 enforcement hours and 1,475 survey hours per month across the country. For the 6,000 enforcement hours, the cameras will operate from vans which will be marked with high visibility reflective material and will display a safety camera symbol. Images of the vans are available on the right hand side of this page. The survey hours will be conducted from unmarked vans, in order to accurately observe and record the speeds at which vehicles are currently travelling, for survey purposes only. Speed kills. Kill the speed. Excessive or inappropriate speed is a significant contributory factor in road traffic collisions. Gardaí use a range of speed detection technology to reduce speed across Irish roads. A reduction in speed will lead to a reduction in the incidence of fatal and serious injuries and will improve road safety for all road-users. We are working closely with a range of partner agencies, including Government Departments, the Road Safety Authority, the National Roads Authority, and the community, in order to develop a national culture of safe road use. An extensive analysis of collisions on the road network where speed was a contributory factor has been completed. The following sections of road, as set out on the map, were identified as having a significant proportion of collisions whereby, in the opinion of the investigating Garda, a safe speed was exceeded. • Van mounted Go-Safe vans (civilian operated). An Garda Síochána appeals to all road users, in particular motorists, to familiarise themselves with these sections of the road network. We also appeal to motorists to always drive at an appropriate speed, to reduce the likelihood of being involved in a fatal or serious collision. The new lower drink-driving limit was passed in the Dáil last night. Provision for a new acceptable blood alcohol limit of 50mg, replacing the current 80mg, is contained in the Road Traffic Bill. The Bill passed through the Dáil last night but was not actually voted on as agreement on its contents was reached on all sides. The Bill now moves to the Seanad where it is due to be dealt with next week. The limit for learner and professional drivers has been cut from 80mg of alcohol per 100ml of blood to 20mg and from 80mg to 50mg for other drivers. Drivers caught over the limit would receive three penalty points and a €200 fine, if they do not challenge the conviction in court, but they would not receive a driving ban.